Moon viewing is a duty on the full moon night of Autumn in Asia, dating back more than 3000 years ! Dumplings with the hare in the moon ! I have a special plate of Bizen pottery for moonviewing dumplings. It has a full moon in the top corner. This is a similar plate, tsukimi sara 月見皿, found online. The custom of moon viewing held in mid-autumn is called tsukimi in Japan. It's said that this moon viewing custom was introduced to Japan from China during Nara and Heian periods (710-1185). Tsukimi takes place on August 15th in the lunar calendar, so it's called jugoya, which means the night of 15th. Jugoya in the solar calendar changes every year and usually falls on September or October. The moon on jugoya isn't always full, but it's said that the moon on the night is the brightest and the most beautiful in the year. How do Japanese people celebrate Tsukimi? It's done in a quiet manner. Traditionally, susuki (pampas grass) or other autumn flowers are decorated in a vase, and dango (dumplings) and satoimo (taro potatoes) are offered to the moon in an alter. People look at the moon, enjoying the beauty quietly. Tsukimi also has the meaning of celebrating the autumn harvest. Commonly, plain dumplings are stacked on a tray instead of skewered. The word, tsukimi, is used in Japanese food as well. For example, tsukimi-soba and tsukimi-udon are well-known. They aren't food for moon viewing. Tsukimi indicates a cracked egg in Japanese cooking since the egg yolk resembles the moon. Tsukimi udon/soba are hot udon/soba noodle soup with raw egg toppings. McDonald's in Japan even sells tsukimi burgers, which are hamburgers with fried egg fillings. On the evening of the full moon, it is traditional to gather in a place where the moon can be seen clearly, decorate the scene with Japanese pampas grass, and to serve white rice dumplings (known as Tsukimi dango), taro, edamame, chestnuts and other seasonal foods, plus sake as offerings to the moon in order to pray for an abundant harvest. These dishes are known collectively as Tsukimi dishes (月見料理, tsukimi ryoori). Due to the ubiquity of sweet potato or taro among these dishes, the tradition is known as Imomeigetsu (芋名月) or "Potato harvest moon" in some parts of Japan. There are specific terms in Japanese to refer to occasions when the moon in not visible on the traditional mid-autumn evening, including Mugetsu (無月 literally: no-moon) and Ugetsu (雨月 rain-moon). Even when the moon is not visible, however, Tsukimi parties are held. They come in three colors, brown (with raw sugar), white (plain) and pink (with shokubeni food coloring). They are not round but oblong, with a sharper edge. They resemble the form of a taro root, the brown one with the skin, the white one without the skin, as an expression for the Harvest Thanksgiving for the Imo Meigetsu taro potato moon. The pink one was "invented" about 30 years ago, when families made them at home and added this color to please the little children. Dango are dumplings which can be either savory or sweet and are often, but not always, served on a bamboo skewer. Savory dango are many times covered in some type of soy-based sauce, which can either be sweet, salty or both, and can be served with nori sprinkled on top or completely wrapped in a sheet of seaweed. There’s an incredible variety of sweet dessert-style dango, which makes the amount of savory varieties pale in comparison. Sweet dango can be filled, topped or crafted with all manner of traditional Japanese dessert (wagashi) foodstuffs. A few of these traditional ingredients include anko (also known as an), goma (black sesame) and kinako (roasted soybean flour). First, let’s break down the different ways of making dango, including cooking methods, ingredients, and end with varieties. Technically, all dango are cooked in some manner. There are many ways to prepare and cook dango, varying in degrees of simplicity and difficulty. Mochiko, glutinous rice flour, is what gives dango their super chewy, gooey texture. Shiratamako, another glutinous rice flour, is also used to make dango. A dango recipe made entirely from mochiko or shiratamako will result in a very soft dango. Shiratamako is lumpy, and must be dissolved in water or ground before using in a recipe. I’ve heard mochiko can be used interchangeably with shiratamako with little to no adverse results. I personally have used mochiko in place of shiratamako and haven’t noticed the difference. Mochiko is also waaaay cheaper than shiratamako, especially if it’s bought under the name “sweet rice flour”. Joshinko, non-glutinous rice flour, can be added in varying amounts to create a firmer dango. I recommend a ratio of no more than 1:1 of mochiko to joshinko for dango which is firm but still has some gooey mouth feel. Anything above that results in a denser, less chewy, harder dango. Water is normally used as in making dango, and boiling water at that. However, nothing’s keeping you from substituting other liquids or semi-liquids (anko, mashed fruit, pumpkin filling, etc.) for a portion or all of the water. Fruit or vegetable juice, rose water, milk, tea, or coffee can all be added to dango to enhance the flavor and change the texture. Also, extracts and concentrated flavorings can be added to alter the flavor. The more liquid used in dango, the softer and gooier it will be. Less water will create a firmer dango, but will also result in a drier dango. Keep in mind you want the liquids hot, unless you plan on cooking the dango ingredients together anyway. Boiling the liquids will dissolve sugars and help bind the mochiko to the other ingredients, which in turn results in smoother, less gritty dango. Certain additives, such as powders, non-rice flours, beans, nuts and seeds can be added to the dough, but it’s important to keep in mind how they’ll effect the texture of the finished dango. Small amounts of powdered spices, espresso powder, cocoa, matcha and powdered milk can be added to the rice flour(s) or dissolved in the water/ juice to create flavored dough. Experimentation with amounts is important in finding a recipe that works with your preferred texture and flavorings. After the dango are steamed and/or toasted, it’s your choice what you top them with, if at all. I personally am a huge fan of anko and goma an (black sesame seed paste) on my plain toasted dango. Drowning freshly browned dango in a sea of beans and sesame seeds is more yummy than it sounds. It’s up to you, though, to choose what to cover your dango with. Sanshoku Dango (Three Color Dumplings: Sanshoku (three colors): Dumplings made with three colors. Contrary to popular belief, sanshoku dango does not refer to a specific variety. 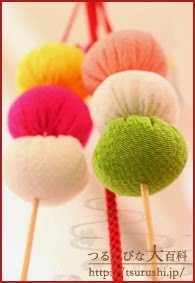 Any dango with three colors is sanshoku dango, including hanami and botchan dango. Dango are also named for festivals and even fictional characters! Hanami Dango (Flower Viewing Dumplings): Three dango on a skewer. Colors are pink (food coloring), white (plain) and green (matcha, yomogi or food coloring). Hanami dango are eaten during cherry blossom season. Tsukimi Dango (Moon Viewing Dumplings): Non-skewered filled or plain dumplings. Usually presented as a pyramid shaped pile of dumplings, tsukimi dango are eaten during the moon viewing festival. 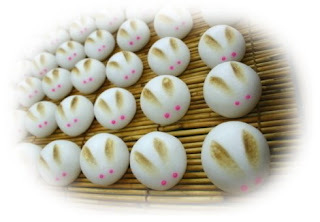 I’ve seen ornate tsukimi dango shaped like usagi (bunnies!) as a homage to the mochi pounding rabbit in the moon. Ikinari Dango (All of a Sudden Dango): Don’t know why this is called dango, but this daifuku-looking dumpling is made with satsumaimo topped with anko, wrapped with mochiko dough and then cooked. It’s a specialty from Kumamoto where it gets its name from being so easy to make. If visitors pop by, all of a sudden, ikinari dango is so simple, it can be whipped up in minutes. Botchan Dango (Named after a fictional character): Three dango on a skewer made from red beans, matcha and egg yolk.
. . . CLICK here for Photos of the Peony Park! The shrine has a famous peony park. Saitama prefecture, Higashi Matsuyama 東松山. "arrow YA (矢／箭) and bow KYU 弓" . They are eaten on January 20. In some areas, the dango are placed in kayu rice grues. dangobana 団子花（だんごばな）"dumplings looking like blossoms"
With the wish for health and prosperity. Kyoto at Shrine Shimogamo Jinja in Kyoto 京都の下鴨神社. This is a rock on the island of Iki 壱岐, which looks just like a monkey. The island has a legend connecting to the story of Momotaro and the demons. speciality of Tokorozawa Town, where Ota Dokan 太田 道灌, the founder of Edo, got to eat the local dango on a hunting trip and liked them very much. The road is along the old Kamakura Kaido　鎌倉街道. ukiuki is a word used for things dumpling on water, as the dumplings do when put into the hot soup. They are prepared for the last prayer to the god of the harvest (nogamisama) to take with him on his way back to the mountains. Nogamisama is a large boulder at the side of the field. Made from millet flour mixed (kibiko きび粉) with dango flour. They are round with a little cavity in the middle "like a navel", so in local dialect they are also called "hetchoko dango "へっちょこ だんご. Senju, now with the great bridge of Senju, Senju Oohashi, was the last stop in Edo before leaving the city. It was the first bridge Tokugawa Ieyasu had build. Matsuo Basho passed here too and now his image is on the pillar of the bridge. An old road is named "Yatchaba Doori やっちゃば通り" 'Yacchaba Dori' with many old shopsings still in place. Mito Komon, on his way home to Mito, used to stop here every time. He placed his spear under an old pine branch to support its weight (yarikake). Near the place is now Kadoya, an old sweet store selling these mitarashi dango. The Moon Festival is also an occasion for family reunions. When the full moon rises, families get together to watch the full moon, eat moon cakes, and sing moon poems. With the full moon, the legend, the family and the poems, you can't help thinking that this is really a perfect world. That is why the Chinese are so fond of the Moon Festival. The Chinese eat the moon cake at night with the full moon in the sky. Typical mooncakes are round or rectangular pastries, measuring about 10 cm in diameter and 4-5 cm thick. A thick filling usually made from lotus seed paste is surrounded by a relatively thin (2-3 mm) crust and may contain yolks from salted duck eggs. Mooncakes are usually eaten in small wedges accompanied by Chinese tea. Making the basic dorodango is a traditional pastime for schoolchildren, somewhat like English conkers. More recently the process has been refined into the art of the hikaru ("shining") dorodango (光る泥だんご), which has a glossy or patterned surface. The core of the ball is made of basic mud, and further dusted with finer-grained soil before the water is drawn out through various methods- even sealing the ball inside a plastic bag and letting the water evaporate and then condense. Once the ball is fully tempered and hardened, it is polished by hand and displayed. Red and white are auspicious colors. The green of mugwort (よもぎ yomogi) adds nice color and also with a wish that this medicine might keep the child healthy. lit. "waiting for the moon night plant"
Japanese moon viewing custom on the night of August 15th (in the lunar calendar) is called tsukimi. People view the beautiful moon quietly at home, gardens, shrines, temples, and so on. Tsukimi this year falls on September 14th. For those of you who want to experience Japanese moon viewing, here are some places you can visit. On the evening of the 15th day of the second lunar month in Spring 16 rice balls are made as an offering, 二月の十六団子 nigatsu no juuroku dango. On the next morning, they are eaten by the family. Before eating them, the empty 臼 mortar is hit with the mallet to make a sound, in order to make the Sakugami harvest deity come down from heaven. In Autumn on the 15th day of the 10th lunar month another set of 16 rice balls is prepared, this time the 十月の十六団子 juugatsu no juuroku dango. Issa begins with the phrase, "if truth be told" (ariyô wa). Makoto Ueda notes that this haiku alludes to a Japanese proverb, "Dumplings rather than blossoms." -- Kyoriku, trans. Haruo Shirane. "The tea shops at Utsunoyama (Utsu Mountain) one of the difficult passes on the Tookaidoo (Eastern Highway) in Suruga (Shizuoka), were famous for their Ten Dumplings ('toodango', a haikai word), small dumplings sold in units of ten skewered on a stick or string. The hokku [aka haiku] suggests that the mountain villages, which made their living by selling special products to travelers, are now in straitened circumstances, causing even their famous dumplings to become smaller. The implied sense of pathos and disappointment is echoed by the 'winds of autumn' ('aki no kaze'), a classical phrase associated with loneliness."